Each vehicle is equipped with a power lift and is driven by a courteous, professionally trained driver. 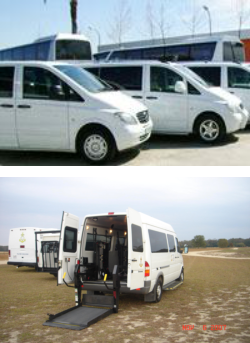 We can transport up to 3 wheelchairs and up to 5 ambulatory passengers in each of our many vans. 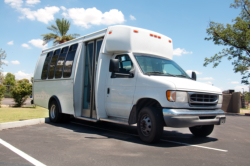 Our recreation bus can hold 6 wheelchairs and 8 ambulatory. Our courier service utilizes sedans, mini-vans, and full size van. All transports and deliveries are real-time tracked by GPS monitoring. H2GO, LLC has a “Door through Door” policy which means clients are picked up from inside their residence or facility and are not left until safely inside their requested destination. For more information regarding this service, or to schedule a pick up in the Central or Eastern North Carolina area, please call 252-523-6400, or 888-523-H2GO (4246). H2GO, LLC serves the areas of North Carolina, South Carolina and Virginia.